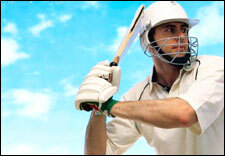 Raju's Cricket Academy Summer Coaching Camp is an event that took place between 15-Apr-2006 and 15-Jun-2006 in Hyderabad. Warrior! Tighten the cricket pads and strap the helmet. Lift your weapon and swing it with all your might. Let your shot cross all boundaries and win the battle for you. Cricket is nothing short of war. But its not just a battle at Raju's Cricket Academy. Cricket's also a whole bunch of fun and riot. There are three batches available at the camp. The first for children between 4 yrs and 12 yrs, the second for cricket lovers above 12 yrs and under 16 yrs, and the third for enthusiasts above 16 yrs and below 18 yrs. The fee is Rs. 3500 per head. Please contact 92465-79013 for further details. fullhyd.com has 700,000+ monthly visits. Tell Hyderabad what you feel about Raju's Cricket Academy Summer Coaching Camp!